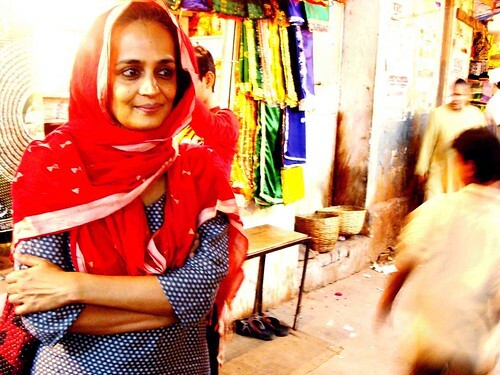 One night, around quarter past ten, The Delhi Walla sighted his most beloved Delhiite – author Arundhati Roy. She was walking in the medieval bylanes of Nizamuddin Basti. Dressed in salwar kurta, Ms Roy was carrying magic secrets in her eyes. She was speaking to no one. A tiny diamond gleamed in her left nostril. Her arms were folded and there was a bright red bag slung on her right shoulder. Although her curly hair were covered in a red dupatta, there was something restless and untamed about her. Her demeanour suggested the recklessness of a suicide bomber. Everyone around looked a bit wary of her. She was like the Osama bin Laden of Words, just beyond our grasp. It was best to just Let Her Be – a literary terrorist. And then, while deep within herself, Ms Roy suddenly smiled. Her luminous nut-brown skin shone as though it has been polished with a high-wax polish. She was the most beautiful woman ever seen. Soon, the smile faded and Ms Roy kept walking straight; her gait suggesting that she had a nice athletic run. After what seemed to be a lifetime, she came very close to The Delhi Walla. Then Ms Roy looked at him, looked away and walked past. Like a jazz tune. This has got to be one of the scariest posts I’ve read. Seriously. I have not read any of her books, but plan to read ‘God of Small Things’, sometime this year. Mrs Roy, how about a collection of short stories from you ? Anything in the offing for fans? Very-vhery true Mr. LumousP …. wow! thats an amazing photograph! oh and btw, dude! you were stalking her. 🙂 kidding! how come she never saw you take the pic?? she is NOT the types to get kho-ied in the Dargah’s music. I know where she stays and I know where she works out. We were on the treadmill next to each other many days, without any talk. She stays like 20 steps away from my house, and I’ve seen her many times unloading groceries with her director husband (tall guy). And yes, I’ve read The God of Small Things.